Click to view all database records for this agency. Click to view the Timeline for this agency in a new window. Surprise Lake Camp has a rich history and is the oldest Jewish sleep-away camp in the country. It was founded in 1902 by the Educational Alliance to provide a summer vacation for Jewish boys from the tenements of Manhattan's Lower East Side. In its first season, it had six tents for 25 campers and five counselors. One of the first campers was Eddie Cantor, who, upon achieving success as an entertainer, became one of the camp's most ardent supporters. Since then Surprise Lake Camp has served thousands of young people, many of whom have achieved prominence, among them, entertainer Neil Diamond, talk show host Larry King, and actor/comedian Jerry Stiller. In 1911, the 92nd Street Y became partners in running the camp, and the camp office was located at the Y for many years. 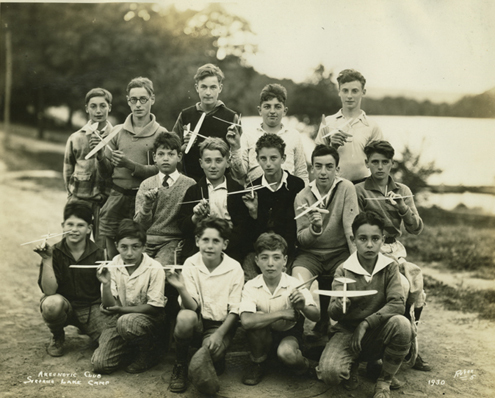 In 1917, when the Federation of Jewish Philanthropies was created, Surprise Lake Camp was one of the initial member agencies. The camp then became incorporated as a New York not-for-profit in 1920, eventually leading to complete independence from its founding agencies. Over the years, Surprise Lake Camp has been substantially rebuilt three times. In addition, its clientele and program have evolved as the Jewish community has changed. 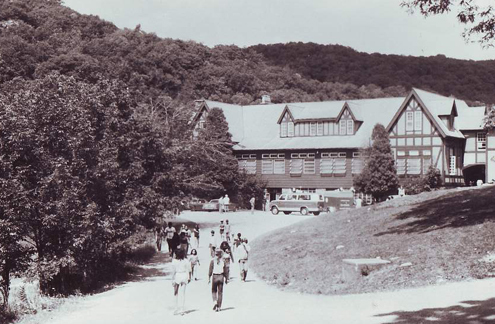 Originally established to provide summer vacations in the country for poor boys from the lower East Side, the camp has also gone through periods when it was dedicated to feeding undernourished boys, operated as a year-round camp which included formal education during the winter, committed to the personal development of children using a social group work model, and run as a general co-ed summer camp with special emphasis on scholarships. Today, Surprise Lake Camp serves Jewish boys and girls from the Greater New York City area and around the globe from seven to 15 years of age. Fees are set according to a sliding scale based on income and family size, with 50-75 percent of the campers receiving reductions. In 2010, over $850,000 in total scholarships were provided, making Surprise Lake what we believe to be the most generous Jewish scholarship camp in the country. Surprise Lake Camp, founded in 1902 by the Educational Alliance, is the oldest Jewish resident camp in the United States. 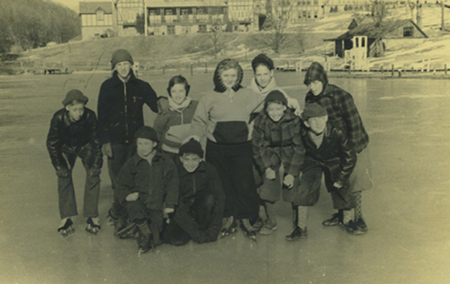 The camp originally served boys from the tenements of New York's Lower East Side in both summer and winter programs. It continues to provide a Jewish camping experience to over 500 children each summer, regardless of their ability to pay. The historical records of Surprise Lake Camp are primarily housed at the 92nd Street Y, where they deposited their inactive records (1905-1976) in 1980. [For a description of those records please refer to the 92nd Street Y page on this website.] However, some records were retained at the Camp's offices in New York City and at the camp itself, in Cold Spring, New York. These two groups of records have been described separately according to their location. 1919-2006 (bulk dates: ca. 1960-2002). Records in the camp's New York City office include correspondence, reports, Board of Directors files, annual books, clippings, architectural drawings, annual reports, camp calendars, brochures, anniversary books and journals, clippings, video tapes, films, slides and photographs. In addition there is a significant amount of material relating to the Alumni Association and a few miscellaneous historical documents notably a 1919 account book listing orders and supplies for the camp: everything from vegetables to team horses. Material pertaining to the Board of Directors includes Board minutes 1958-2007 (in the Annual Books), miscellaneous correspondence, and board member files. Annual Books and Annual Reports (1942-2007. Each year Surprise Lake Camp puts together an "Annual Book" including minutes, budgets, forms, the camp calendar, staff procedures, audits, newsletters, administrative information, and copies of camp publications. These bound volumes span the years 1958 to 2005 and include comprehensive information on camp activities, procedures and financial matters. In addition the records include annual reports for 1942; 1946-1980, and financial statements, ca. 1940-1949. The records of the Surprise Lake Camp Alumni Association, the Eddie Cantor Camp Committee and the Women's League of the Eddie Cantor Camp Committee include by-laws, minutes, records of donations, copies of Re-Echoes, the alumni association newsletter, printed matter, financial records, lists of alumni, programs for events, and newsletters. Also included is the certificate of incorporation (1947) for the Women's League of the Eddie Cantor Camp Committee. Camp fundraising activities, directed by the alumni associations, were often related to anniversaries and the files include correspondence, brochures, anniversary books, and events planning for the 80th, 90th and 100th anniversaries. Correspondence includes letters to donors for the 100th Anniversary "Fund for the Second Century" (2002). A few items from the camps historical files have remained at the camp office. These include the 1919 account book, winter camp reports (1936-37 and 1940-41), a survey of the Surprise Lake winter camp by Nathan Cohen (1948), counselor correspondence and applications, and counselor in training papers, (1936). Photographs and slides include images taken at camp as well as photographs from a 1992 benefit and two aerial photos of the camp (one dated 1993). The office holds multiple copies of the 100th Anniversary videotape as well as other promotional videotapes, camp videotapes (ca. 1980-2005), and videotaped interviews with Jordan Dale. Several 16 mm films are unidentified. Records stored at the campsite in Cold Spring include camper registration and medical records, staff applications and contracts, infirmary records, administrative files including financial records, maintenance, renovation and construction information, subject files, alumni materials, newsletters, photographs and slides. Because of the relationship between Surprise Lake Camp and the Educational Alliance, the survey also found material pertaining to The Educational Alliance among the records at Surprise Lake. Financial records consisting of bank statements, canceled checks, etc., were not included as part of this survey. The archives room and the storage room, both located in the main building, contain camp applications, counselor evaluations, camper registration cards, and staff applications and contracts. Many campers were on scholarships; others had emotional problems and were involved with social service agencies. Recommendations and evaluations from the social service agencies involved in the care of these children were often attached to the applications. Counselor evaluations of the campers describe the camper's adjustment to Surprise Lake and detail a child's problems and progress. Administrative material pertaining to camp maintenance and renovations, construction, building plans, and land purchase. Files also includes office correspondence. Materials pertaining to activities of the Educational Alliance, as well as documents relating to the Educational Alliance's involvement with Surprise Lake Camp. These included an incomplete run of Yearbooks (1940s to 1960s) from the Educational Alliance Alumni Association and the newsletter, "Alliance Alumnus: Voice of the Alumni Association of the Educational Alliance" (1955-1965). In preparation for camp activities, programs and religious services, the camp maintained subject files on various topics including Jewish culture and history, drama programming, games, environmental issues, and drug abuse. These files consist of booklets, pamphlets, and other printed matter. Of particular interest are the files pertaining to religious observance at Surprise Lake which include original documents with information on camp policy, song sheets, and handouts prepared by the camp for Sabbath and other religious observances. Alumni records include correspondence, committee reports, newsletters, testimonials, and anniversary programs. Alumni played an integral part in the funding, support and spirit of the camp. In honor of one of their most famous alumni, an Eddie Cantor Camp Committee was started in the 1920s to garner support and raise funds for the camp. Records of the committee include minutes of their meetings as well as some programs from their annual fundraisers, the earliest from the 1920s. Important anniversaries were celebrated with alumni at the camp and historical material was culled for use in the anniversary programs and booklets. Records from these events include anniversary programs, alumni correspondence, alumni testimonials, tributes, photos, telegrams, clippings, and committee reports for the 35th, 50th, 70th, 80th and 90th anniversaries. Visual materials at the camp include photographs, slides, lantern slides, and filmstrips. 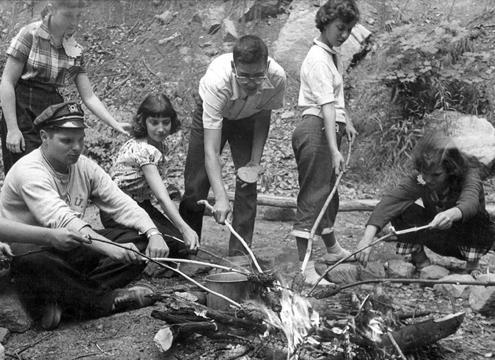 Images include approximately 500 snapshots of campers and camp activities, ca. 1980s, approximately 300 slides, ca. 1980s-1990s, and 48 framed photos of personalities, some inscribed to the camp. Other images are of the Labor Day weekend family camping, 1990-1994. The lantern slides and filmstrips were used for educational programs at the camp. Issues of the camp newsletter, Surprise Lake Camp Echoes include news, editorials, projects, trips, and reports by the campers. Echoes was published weekly. Surprise Lake Camp's Board of Directors and Executive Director agreed in late 1980 to transfer a portion of the camp's inactive records to the Archives of the 92nd Street Y. The bulk of transferred records had accumulated over many decades at the camp and had been kept in a storage room in the camp's administration building. The camp retained custody of records generated since the 1950s concerning campers and staff. These records were in the storage at the camp in 1980. The transfer to the Y's Archives also included some materials that had been stored in the New York City office of the camp. SLC records in the Y's Archives also consist of documentation found among the Y's own records, especially within the files of the Executive Director. - Minutes and reports of the Joint Vacation Camp Committee, 1910-13, and Surprise Lake Camp Committee/Board of Directors, 1914-57. Additional committee reports may be found in the minutes of the Y's Board of Directors. - Reports of the Superintendent/Administrator/Executive Director to the Camp Committee/Board of Directors, 1905-61. - Legal records, consisting of deeds, mortgages, bequests and tax matters. - Financial records, 1910-50s, consisting of treasurer's reports, budgets, building fund files and ledgers. - Administrative files of the Superintendent/Administrator/Executive Director, 1911, 1920-60s, consisting of correspondence, reports and printed materials on all aspects of the camp. - Rosters of staff members, 1938-39, 1947, 1960-76, and of campers, 1936-42. - Echoes, the SLC newspaper, 1914-53. - Records of the Eddie Cantor Camp Committee and its Women's League, 1922-50s, concerning fund-raising for the camp and improvements to the physical plant. - Records of the Surprise Lake Camp Alumni Association, since 1961, consisting of their newsletter, Re-Echoes, and other printed items. 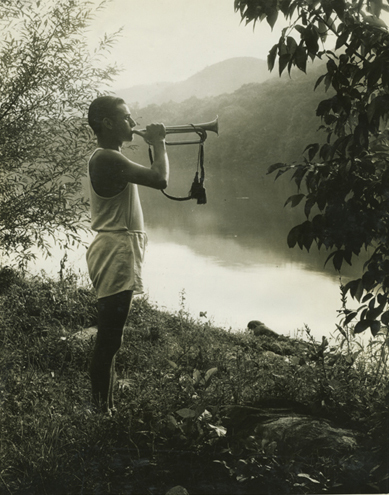 - Photographs, 1910-60s, illustrating all aspects of the camp's activities.